Eating with the Ecosystem is conducting a citizen science research project, as part of a larger study in partnership with the University of Rhode Island to understand the disparities between the relative production of marketable seafood species from our New England marine ecosystems and the relative landings of these species in our local fisheries, highlighting opportunities for greater utilization of species whose production is high relative to their landings; i.e. what species are our ecosystems producing a lot of, that we could be eating more of. Eating with the Ecosystem will use this information to create a science based template for a better overall ecosystem-marketplace match for New England seafood, helping to balance our ecosystems, support local fisheries, and increase consumer awareness. This exercise will help determine the availability of local species in the marketplace and help shed light on the role of consumer preferences in driving disparities between ecosystem production and market share for certain species. This information will also identifying opportunities for growth for those species that are underrepresented in the marketplace but enjoyed by consumers. Eating with the Ecosystem will utilize these insights to design a toolkit for seafood wholesalers, retailers, promoters, and eaters, detailing the importance of ecosystem-market symmetry and charting a roadmap to attain it. Visit our blog to for highlights from our citizen scientists every week. Description: Acadian redfish are found in deep waters from the Gulf of Maine northward. Their lives consist of swimming near the seabed on rocky and dining on crustaceans, mollusks, and smaller fish. Their predators include halibut, codfish, and seals. Redfish can live for 50 years or more. Their slow growth rate made them vulnerable to fishing pressure in the past, but they are now thriving again. Description: Black sea bass are found from Cape Cod to the Gulf of Mexico. They summer inshore off southern New England and winter offshore off the Carolinas. They are bottom fish, and love the nooks and crannies around wrecks and pilings, where they munch on crabs, lobsters, and shellfish. Black sea bass begin life as females, but when the dominant male in a group dies, a female turns into a male and takes his place. Description: Blue crabs are a swimming estuarine crab common in the Mid Atlantic and Gulf of Mexico. In some years, it is plentiful in Southern New England estuaries, while in other years, it is scarce. Warming waters associated with climate change are expected to bring more blue crabs to New England. Blue crabs are omnivores that eat both plants and animals. They are prey for many fish and sharks. Description: Bluefish are a migratory species found from Maine to Florida. They move north in summer and south in winter. They generally school by size, and their schools can cover tens of square miles of ocean. They are fast growers and opportunistic predators, feeding voraciously on anything they capture. Sharks, tunas, and billfishes are the only fish predators large and fast enough to prey on adult bluefish. Description: Bonito is a member of the scombroid family, along with mackerel and tuna. They grow to 3 feet and resemble small tunas. Bonitos swim fast and far, and travel in schools. These schools visit New England waters in summer and fall, where they snack on mackerel, menhaden, and squid. Bonito can be spotted leaping from the water as they chase their prey near the surface. Description: Butterfish are common between North Carolina and the Gulf of Maine. These small schooling fish are short-lived and fast growing. They shift their distribution with temperature, moving northward and inshore in summer to feed and spawn, and southward and offshore in winter to avoid the cold. They eat small invertebrates and are prey for fish, mammals, and seabirds. Description: are cold- water predators once found in vast quantities on Georges Bank and the Gulf of Maine. They prefer gravel and sand bottoms between 50-300 ft., where they feed on almost anything smaller than themselves: shellfish, lobsters, squid, other fish. Their numbers have declined in recent generations, replaced by ecologically analogous fish such as dogfish and skates. Description: Knobby (Busycon carica) and Channeled (Busycotypus canaliculatus) Conchs (or Whelks) are inshore species that move between deep and shallow water, depending on the time of year. They roam in sub-tidal sandy areas, eating clams, mussels, and other bivalves. They wedge a bivalve open using the edge of their shell, and insert their long proboscis to eat the flesh of their victim. Description: Croaker are found in sandy and muddy parts of sounds and estuaries of the Mid-Atlantic and South-Atlantic. They feed on worms, crustaceans, and small fish, and are eaten by bluefish, weakfish and striped bass. Croaker populations vary greatly from year to year based on environmental conditions. This species is moving north into New England waters with climate change. Description: Cunner are a close relative of the better-known tautog. They are year round residents that primarily stick close to shore, swarming among eelgrass beds and pilings. Their principal foods are barnacles, mussels, and other invertebrates. The cunner was a favorite food fish in the 19th century, but today the market for this species is very limited. 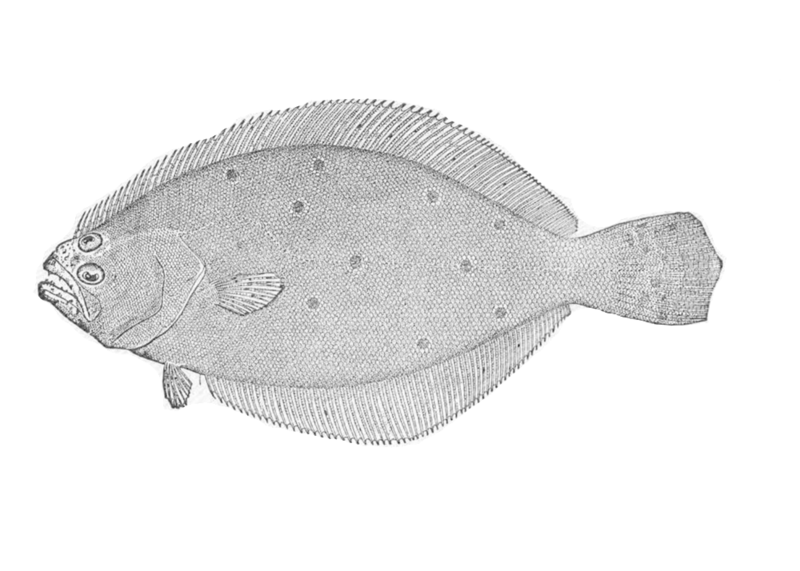 Description: Dabs are right-handed, large mouthed flounder found in cold waters from Georges Bank northward. Dabs are sedentary fish that make small movements for spawning and feeding. Their favorite foods are sand dollars, sea urchins, and brittle stars, but they are flexible eaters, content with whatever's on offer. They are eaten by dogfish, monkfish, cod, and sharks. Description: Grey sole is a right- handed flatfish that reaches up to two feet in length. It frequents areas of muddy sand and avoids shallow waters. It is a stationary (non migrating) fish that prefers water under 50 degrees F. In New England, it is found primarily in the Gulf of Maine. Its small mouth is built to eat small crustaceans, starfish, small mollusks, and worms. Description: Haddock live near the bottom on habitats of gravel, clay, and sand. Haddock are fast-growing fish that feed on a variety of bottom- dwelling animals, including mollusks, worms, crustaceans, sea urchins, and occasional small fish and fish eggs. Spiny dogfish, skates, and many other groundfish species prey on juvenile haddock. Gray seals also prey on adult haddock. Description: Halibut are the largest of the flatfishes, weighing into the hundreds of pounds. They prefer cold waters and are usually found on sand, gravel, or clay bottoms. Halibut dwelling in deeper water are larger than those in shallower water, suggesting that they move deeper with age. Halibut have a healthy appetite, feasting on all kinds of fish, crabs, lobsters, shellfish - even sea birds and bits of wood. Description: Herring are found from the Gulf of Maine to the Mid-Atlantic. They migrate in schools of thousands of fish to areas where they feed, spawn, and spend the winter. They feed on zooplankton and larvae, and are preyed upon by virtually everything larger than them in the ecosystem. The smallest harvestable herring are known as sardines. Description: John Dory is a solitary deepwater fish with a vertically flattened body shape and upturned mouth. Its shimmery, scaleless silver skin bears a "St. Peter's thumbprint" just behind its gills, a trait it shares with spot and haddock. John Dory are found along the outer continental shelf from the Chesapeake Bay to Nova Scotia and are landed as an incidental catch by boats pursuing other targets. They eat fish, squid, and crustaceans. Description: Jonah crab is a common subtidal crab that ranges from Newfoundland to Florida. Its habitat preferences range from rocky to silty bottoms. Jonah crabs move offshore in fall and winter, and inshore in summer. They eat mussels, snails, and crustaceans. Formerly a bycatch species for lobstermen, Jonah crabs have emerged as a major commercial fishery in their own right. Description: Lobster are found in all New England ecosystems, but are most famous and abundant in the Gulf of Maine. The lobster can weigh 10 pounds or more. They are scavengers and eat both live and dead prey, including mussels, clam, worms, fish and crabs. Predators include cod, flounder, seals, and crabs. Lobsters are showing a dramatic northward shift with climate change. Description: Mackerel are found from Labrador to North Carolina. They swim in schools near the surface, traveling to and from spawning and summering grounds. A southern group spawns in the Mid-Atlantic Bight while a northern group spawns in the Gulf of St. Lawrence. Mackerel eat plankton, krill, shrimp, and squid, and are prey for a wide range of fish and mammals. Description: Mahi-mahi are a warm-water fish caught from Massachusetts to Texas. Juveniles swim in schools, while older fish are found alone in open ocean habitat. They grow up to seven feet in length. Mahi, as they are known for short, are top predators, eating many other fish. They spawn under patches of floating seaweed called Sargassum. Description: Mahogany clams are found in open-ocean waters of the North Atlantic from 25 to 1,300 feet deep. Living just below the surface of the sand, they extend their siphons to filter-feed plankton from the water column. Mahogany clams are some of the longest living animals on the planet, surviving up to 400 years if undisturbed. Other Common Names: Goosefish, American anglerfish, bellows-fish, devil-fish, headfish, molligut, satchel-mouth, wide-gape. Description: Monkfish are found in deep water from North Carolina to the Gulf of Maine. They perform seasonal inshore-offshore migrations. Monkfish can grow over three feet in length and can weigh upwards of 30 lbs. Their huge mouths help them eat tremendous quantities of everything they come across: fish (including other monkfish), lobsters, crabs, shellfish, and even seabirds. Description: Mussels are cold- and temperate water bivalves that live in dense beds in intertidal and subtidal areas, where they attach to rocks using strong and elastic thread-like structures called byssal threads. They filter-feed plankton and particles from the water column and act as prey for starfish, snails, tautog, and cunner. Like clams, mussels have growth rings that show their age. Description: Peekytoe crabs are found on rocky bottoms from the low tide line down to 2000 ft. They are similar in appearance to Jonah crabs, and the two overlap in habitat, although the sand crab is generally found in shallower water than the Jonah. Sand crabs are now to enjoy a meal of worms, clams, mussels, and other crabs. They are eaten by fish, gulls, and crabs. Description: are intertidal snails living on rocky shores of the North Atlantic (though they can be found down to 180 feet). Native to European coastlines, the periwinkle was introduced to the East Coast in themid-19th century, probably through rock ballast. They are now a dominant intertidal omnivore, scraping microalgae off rocks and snacking on barnacle larvae. Larger snails, sea stars, and fish eat them. Description: Pollock are a cod-like fish found chiefly in the Gulf of Maine and Scotian Shelf. They grow fast, reaching over three feet in length. Juveniles live inshore, congregating at low tide and scattering at high tide to hide among seaweed beds. Adults live offshore, schooling in large numbers and moving up and down in the water column in pursuit of fish and crustaceans. Pollock are eaten by dogfish and monkfish. Description: Quahogs live partially buried in the sand in estuarine waters with medium salinity levels such as bays and coastal salt ponds. They feed on plankton and particles by filtering water using a siphon that they extend from within their shell. Well protected by their thick, hard shell, they are nonetheless prey for sea gulls and other animals. They are well adapted to many conditions. Description: Razor clams live buried in the sand in shallow, protected waters. They extend siphons out of the sand to filter edible particles from the water. When disturbed, they can burrow up to three feet down with astonishing speed. This ability comes from the streamlined shape of their body and their long “feet”. They use their feet to swim, burrow, and jump. Crabs, fish, and seagulls are fond of eating razor clams. Description: Red hakes are members of the cod family that are widely distributed on muddy bottoms throughout New England. As juveniles, they take refuge from predators inside shells of live sea scallops. As adults, they chase crabs, haddock, silver hake, and other fish. They are eaten by cod, dogfish, and monkfish. Red hake move to deeper water with age. Description: Sculpin are cold-water fish. With little preference for depth or bottom type, they are ubiquitous in the Gulf of Maine and Georges Bank. Despite being sluggish swimmers, they are voracious feeders, enjoying meals of fish fry, crustaceans, sea urchins, and worms. Description: Scup is a plentiful Mid-Atlantic fish, they browse on invertebrates, crushing their shells with their strong molars. Scup migrate north and inshore to spawn in the spring, then migrate south and offshore in autumn as the water cools. Description: Sea robin are common coastal bottom fish in Southern New England. They migrate inshore in summer and offshore in winter to avoid the cold. Sea robins are voracious, hunting shrimps, crabs, worms, and small fish. Although sea robins are common and edible (closely resembling the commercialized European gurnard), they are treated as a bycatch, and there is little market for this species. Description: Sea scallops are found in offshore habitats of firm sand, gravel, shells, and rock. They occur in congregations called beds, located where temperatures, food availability, and substrate are favorable, and where physical oceanographic fronts and gyres keep larval stages in the vicinity of the spawning population. Scallops feed by filtering algae and particles from the water. Description: Sea urchins are found on rocky coasts from tidal pools down to 80 ft. Their principal food is kelp, although they can also eat coralline algae, diatoms, and small barnacles. In kelp beds, urchins form a dense "front" or concentration of urchins that can quickly decimate the bed and change the habitat. Crabs, lobsters, and groundfish keep urchin populations in check. Description: There are seven species of skate in New England waters, but Winter Skate (Raja ocellata), also called Raja, is most common on dinner tables. Skate feed on crustaceans, clams, squid and small fishes, and are eaten by monkfish, sharks, and mammals. They reproduce by releasing egg pouches - the familiar "mermaid's purses" found on the beach. Skate numbers exploded in the 1980s and 1990s when groundfish like cod declined. 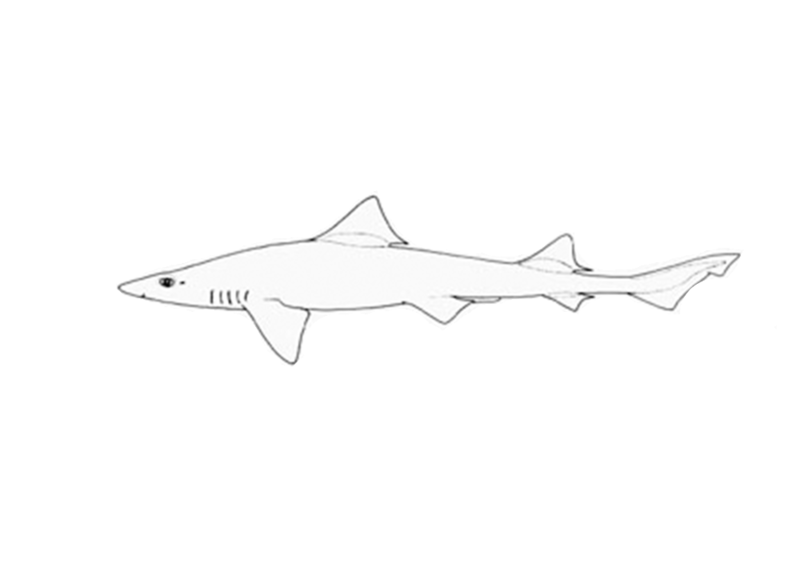 Other Common Names: Dusky smooth-hound, Dog shark, (the majority of dogfish you see in markets labeled "dogfish" is spiny dogfish not smooth dogfish. Smooth dogfish is often sold at a higher price point). Description: Smooth dogfish are highly abundant small sharks found from shallow to deep waters. They mature slowly and give birth to live young. They feast on fish, crustaceans, and plankton. Dogfish were one of the species that "replaced" cod and other groundfish on Georges Bank in the 1980s, and they continue to dominate today. Description: Softshell clams are an estuarine bivalve that burrows in soft sands and gravel in the intertidal and shallow subtidal zone. Steamers are an intermittent species in Southern New England, making sudden appearances in specific spots, but are more consistently present in the Gulf of Maine. However, predation by the invasive green crab has taken a toll on softshell clam populations in recent years. Other Common Names: Cape shark, dogfish (most dogfish you see in markets is spiny dogfish not smooth dogfish. Smooth dogfish is often sold at a higher price point). Description: Spiny dogfish are highly abundant small sharks found from shallow to deep waters. They mature slowly and give birth to live young. They feast on fish, crustaceans, and plankton. Dogfish were one of the species that "replaced" cod and other groundfish on Georges Bank in the 1980s, and they continue to dominate today. Description: Spot live in shallow waters from Texas to Massachusetts, often near pilings and jetties. They form schools just below the surface and prey on worms, mollusks, crustaceans, and detritus. They are eaten in turn by bluefish, weakfish, striped bass, and sharks. Spot are related to the drum, weakfish, and croaker. All four can make a drumming sound by vibrating their swim bladder. 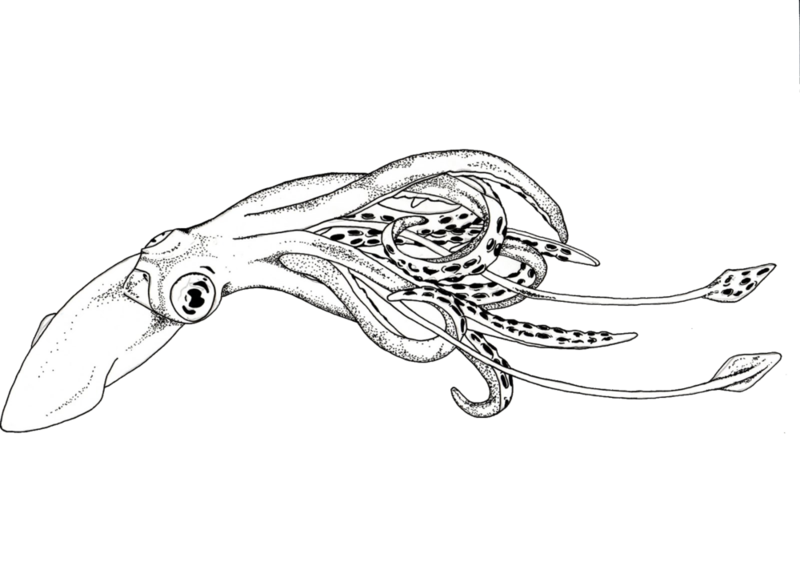 Description: Squid, more specifically Loligo or Longfin Squid, live for only nine months and die immediately after spawning. They migrate offshore during late autumn, overwinter in warmer waters along the continental slope, and return inshore in spring. They are aggressive hunters, and eat worms, small fish, and small crustaceans. They are important prey for many marine mammals, diving birds, and finfish. Description: Striped bass are a premier sport and commercial fish up and down the East Coast. They are an anadromous fish, living in saltwater but returning to freshwater in the southern part of their range to spawn. They live up to 30 years and attain lengths of five feet by gorging on all kinds of fish, crabs, and squid. They are found in New England waters in summertime. Description: Summer flounder are large-mouthed, left-handed flounders common from Cape Cod to North Carolina. Juveniles spend time in marsh creeks and seagrass beds of southern estuaries. Adults make annual migrations offshore in winter and inshore in summer. They are active and opportunistic predators, eating squid, crabs, shrimps, mollusks, and sand dollars. Description: Surf clams burrow in the sand, from the beach to the offshore ocean. They are a saltwater (not estuarine) clam. Like all clams, they filter-feed for a living, sucking in plankton and organic particles from the water column. Harvested by offshore dredge boats, these are the clams you'll typically find as fried clam strips at your local clam shack. Description: Swordfish are wide-roaming oceanic fish that stay off the bottom and away from the coast. They like warm water, and are found from Georges Bank to the Gulf of Mexico. They do not school, although they sometimes congregate together. They eat fish - herring, mackerel, whiting, and butterfish - and squid. The heaviest swordfish landed in New England was over 1,000 pounds. Description: Tautogs are a coastal fish, rarely ranging more than a few miles from land. They haunt rocky shores, ledges, wrecks, and mussel beds, where they alternate between munching on mussels and barnacles and lying inert, hidden in crevices. They spend the winter in a restful state nestled in eelgrass, and become active again in April. Description: Golden (Lopholatilus chamaeleonticeps) and Blueline (Caulolatilus microps) Tilefish live in burrows or "pueblos" in deep canyons on the edge of the continental shelf, from Southern New England to the Gulf of Mexico. They are slow growers and can live over 40 years. Tilefish eat shrimp, crabs, clams, snails, worms, anemones, and sea cucumbers. They are eaten by monkfish, dogfish, conger eels, and sharks. Description: luefin tunas (Thunnus thynnus), yellowfin tunas (Thunnus albacares), bigeye tunas (Thunnus obesus), albacore tunas (Thunnus alalunga), and skipjacks (Katsuwonus pelamis) all visit New England waters in the summer and fall. Tuna are warm-blooded fish whose bodies are highly specialized for fast swimming over long distances. They are top predators in the oceanic food web, eating many other types of fish. Description: Weakfish are a warm-water fish that resides year-round off the Carolinas, with part of its population migrating into Southern New England waters in summer. Their favorite habitats include open sandy shores and in larger bays and estuaries, including salt marsh creeks. They dine on crabs, mollusks, and small fish. Description: White hakes are bottom dwellers that prefer sandy and muddy bottoms. White hake are larger than both Red and Silver hake. They are members of the cod family and can be found from Newfoundland to Virginia. White hakes are slow swimmers which use their threadlike pelvic fins to help feel for food such as small crustaceans, squid and small finfish. They are preyed upon by diving seabirds and other groundfish including larger hakes. Description:Whiting are the smallest member of the cod family in New England. They move up in the water column to feed at night and return to the ocean bottom during the day to rest. They are voracious predators on fish, crustaceans, and squid, and are prey for a variety of larger species. They move offshore in fall and inshore in spring. Description: Winter flounder are a small-mouthed, right-handed flounder found from the Mid-Atlantic to the Gulf of Maine. They reproduce in estuaries, returning to the location of their birth to spawn. This makes them highly vulnerable to nearshore habitat degradation and climate change. Winter flounder eat shrimp, clams, and worms, and are eaten by larger fish. Description: Yellowtail flounder are right-handed and small-mouthed flounders that reach up to 22 inches in length. They like waters neither too deep nor too shallow, have a broad temperature tolerance, and do not make migrations. They are found primarily in Southern New England, Stellwagan Bank, and Georges Bank. Yellowtail eat small crustaceans and shellfish and are eaten by dogfish, skates, cod, hakes, flounders, and monkfish.